When stocks enter a corrective phase, the main question investors need to ask themselves is, has anything changed from a macro point of view? One of the problems with trying to answer this question is that corrections generally are born out of a period of high confidence and/or complacency. A period where everyone knows the bullish case. A period where everyone is confident about the outlook. And a period where everyone "knows" what is going to happen next. Well, until something changes, that is. The point is that when you are comfortable with your premise and everyone agrees with your view, seeing a change in the environment can be tough. Things are going well. Nobody wants anything to change. So, first understanding and then accepting the facts that (a) something is changing and (b) you may need to make adjustments to your portfolio strategy, can be challenging. From my seat, we are seeing this type of scenario play out in the here and now. For example, one of the key fundamental drivers of the current bull market cycle has been robust corporate earnings. Make no mistake about it; earnings have been strong and have been consistently coming in above expectations. In fact, analysts project that EPS (earnings per share) growth for the S&P 500 will come in at 26.4% for calendar year 2018. Impressive. Yet during the current earnings season, stocks have generally not been rewarded for their earnings/revenue "beats." Companies report earnings and revenues that are above expectations, management says good things about the business, and the stock proceeds to decline. What gives? Besides the obvious worries about the impact of tariffs and rising rates, there appears to be something bigger at work here. As in, this may be as good as it gets on the earnings growth front for a while. And historically, this has been a problem. Before we get to the numbers, it is vital to keep in mind that the stock market is a discounting mechanism of future expectations. We can argue until the cows come home about how far down the road the market tends to look. But the bottom line here is that the rate of earnings growth is going to slow in 2019. A lot. Here's the math. For calendar year 2018, EPS for the S&P is expected to $157.38. For 2019, that number is projected to be $176.36, which is an increase of 12.07%. As such, the bulls can be heard telling folks that stocks can go higher because earnings are still movin' on up. And if earnings grow by 12%, it is logical that the major indices could climb at least at a similar rate. But there are a couple problems with this thinking. First, the law of large numbers tells us that the current gangbuster earning growth rate is unsustainable (with 47% of the S&P 500 companies reporting, Q3 earnings are currently running at 29.3% above year ago levels). And second, a large part of the current earnings growth can be attributed to the tax stimulus bill, which won't be repeated. The key point to understand is that while it may sound completely counterintuitive, the stock market tends to struggle when (a) earnings growth is high and (b) the rate of earnings growth decelerates. Here's the way this works. Since stocks are always looking ahead, the best returns occur after a downturn as the market begins to "discount" better days ahead. Conversely, by the time the anticipated strong earnings numbers actually show up, the good numbers have already been priced in and the market proceeds to look ahead and "discount" the future. Looking at the rate of growth in EPS, NDR's computers tell us that when earnings growth begins to decelerate, returns have been subpar. And with the rate of growth that is currently expected, the S&P has averaged just 3.3% since 1928. Super. Unfortunately, there is one more aspect of this analysis that tends to lean the bear camp's way. 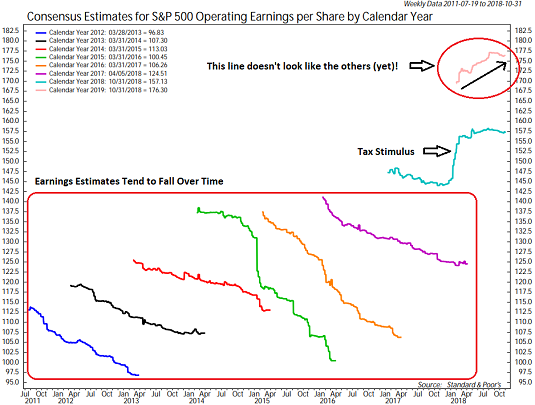 You see, analyst estimates for the coming year's earnings typically start out too high and then fall over time. 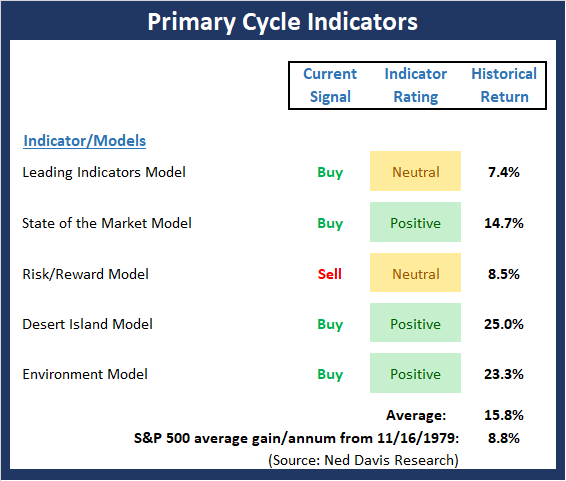 This is illustrated on the chart below from Ned Davis Research. The squiggly lines within the red box at the bottom represent the progression of the consensus estimates for S&P 500 EPS over time. You will note that from 2012 through 2016, the squiggly lines all move down and to the right. This means that as time goes on, estimates tend to move lower. Until 2018 and 2019, that is. The teal line that looks different from the rest is 2018's case. As usual, the line began moving down and to the right. But then the tax bill got passed. Bam - earnings estimates went up. Now look at line in the upper right. This is the consensus estimate for 2019. This line also doesn't look like the others. Instead of moving down and to the right, it is moving up and to the right. This means that analysts have been increasing their estimates for next year. This would seem to suggest that "this time it's different." But as most investors know, betting on those four words tends to be a death knell for portfolio performance. My takeaway from this analysis is that it is important to understand how the stock market game is played. So, for starters, as the saying goes, something that everybody already knows (in this case, strong earnings) isn't worth knowing - because it's already priced into the market. But what most folks don't know is that the RATE of earnings growth is also very important. And with the current growth rate in the unsustainable zone and falling, this combination has historically been, at the very least, a headwind for stocks. The good news is that stocks are currently entrenched in a corrective phase. This means the market very well could be "discounting" the declining rate of earnings growth as well as the various potential potholes that may appear on the road ahead. It is also good news that Wall Street traders tend to overdo EVERYTHING! As such, it is safe to assume that if pessimism about the future takes root, it too will be overdone in time. This could lead to earnings expectations being too low, which could, of course, produce the type of "upside surprises" that tend to create strong and sustainable rallies. But for now, it appears that investors are a bit concerned about the current earnings game. The key takeaway from the Primary Cycle board is simple. The secular bull remains intact. This week's mean percentage score of my 5 favorite models improved to 72.5 (from 63.5%) while the median was unchanged at 75%. And as I pointed out last week, it is worth noting that the historical return of the S&P 500 with the current model readings is strong and well above the average. Not much change to the Trend board this week. The question of the day remains if we are seeing a dead cat bounce play out or a resumption of the uptrend. The odds would favor a bottoming process at this stage. As such, we should look for a retest phase in the near-term. However, a break above last weeks' high would likely turn the tables and embolden the bulls into year end. 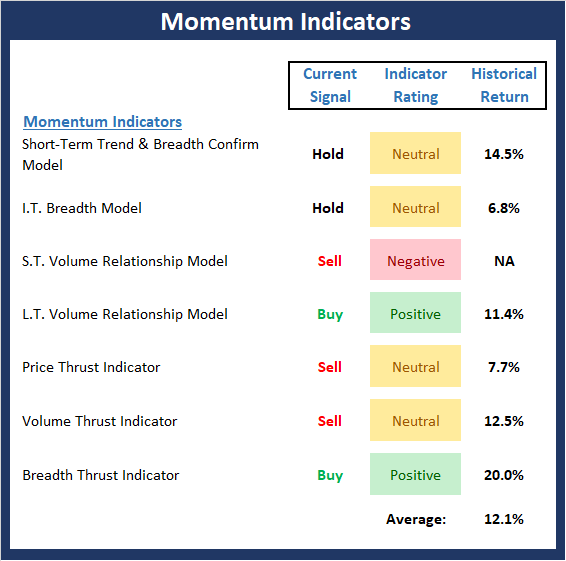 There is more good news to report on the momentum front this week. First, our I.T. 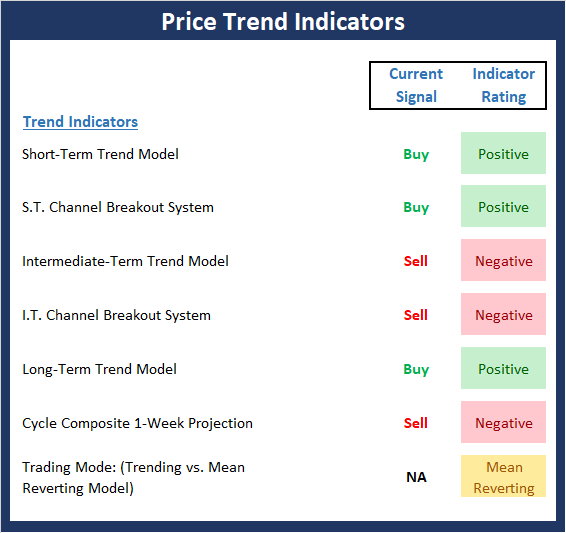 Breadth Model, which had been very close to issuing an important sell signal, improved a bit more last week. Next, the Price Thrust indicator, which had fallen into the "it's so bad, it's good" zone has now reversed into the neutral zone. Finally, the Breadth Thrust indicator on the NASDAQ has flashed a buy signal and is now positive. 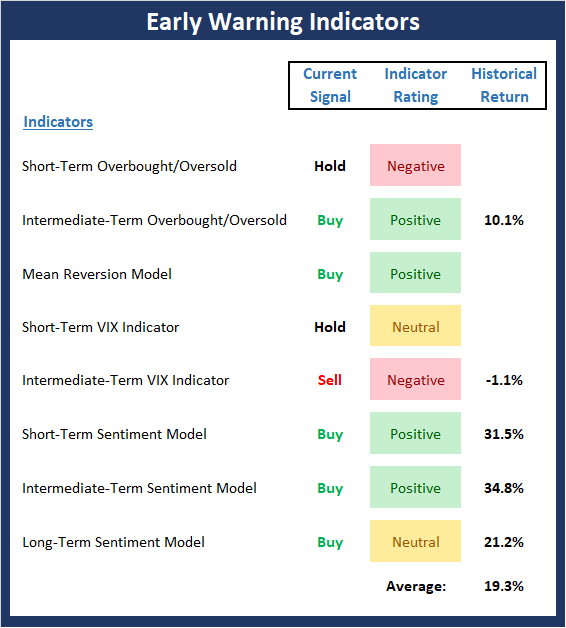 After providing a strong indication that stocks were oversold and due to bounce, the "Early Warning" board is now starting to edge toward another "warning" - this time favoring the bears. However, the board is not there yet and still suggests the bulls can maintain control. 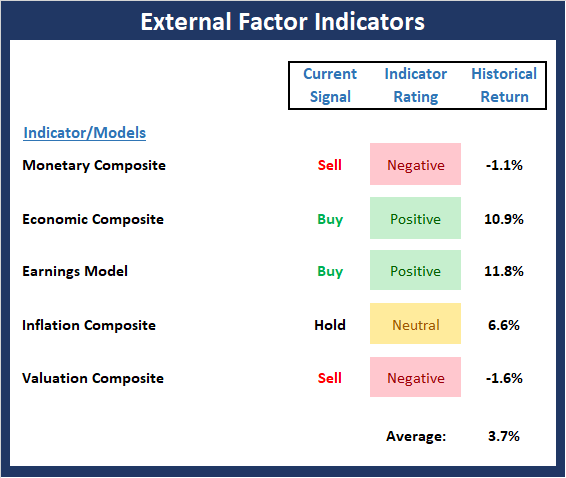 There are no changes to the External Factors board this week. While I apologize for continuing to sing the same song here each week, the takeaway from this board is that risk factors remain elevated.